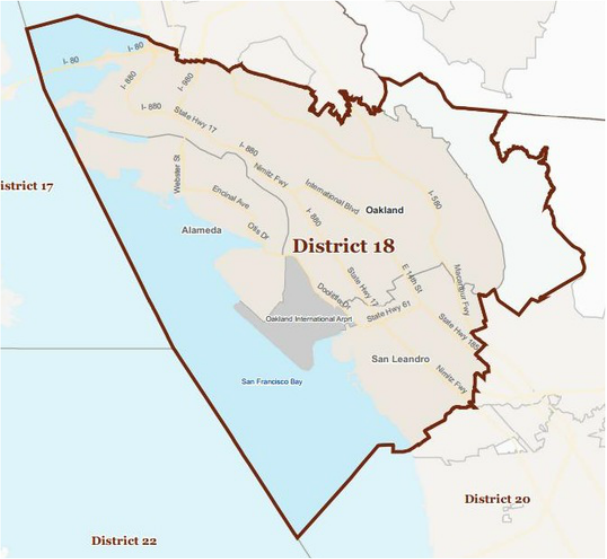 Democrat Rob Bonta currently represents Assembly District 18 and will not be termed out until 2024. Bonta is expected to easily win re-election in 2016. Assemblymember Rob Bonta was elected to the California State Assembly's 18th district in 2012, where he represents the cities of Oakland, Alameda, and San Leandro. Assemblymember Bonta is also the first Filipino-American to be elected to the California State Legislature. Assemblymember Rob Bonta serves as Chair of the Public Employees, Retirement, and Social Security committee. He also serves as a member of the Health, Transportation, Banking and Finance, and Elections and Redistricting committees. In February 2013, Bonta was appointed by Speaker John A. Pérez as Chair of the Select Committee on Gun Violence in the East Bay. The Select Committee is currently conducting hearings and meeting with stakeholders from across California to help identify some of the root causes of gun violence and more deeply examine the more successful community efforts at reducing gun violence. Prior to serving in the Assembly, Rob Bonta was the Vice Mayor of the City of Alameda, where he strongly supported public safety, fostered economic development, and exercised fiscal responsibility. Throughout his career in public service, Assemblymember Bonta, 41, has distinguished himself as a strong advocate for California's public schools and job creation. In the Assembly, Assemblymember Bonta has introduced and supported legislation to help keep our neighborhoods safe from gun violence, provide a quality education to all of our children, build prosperous communities, and protect our social service safety net. Prior to being elected to the City Council, Rob was an elected member of the Alameda Health Care District Board of Directors, where he championed access to quality health care for all. He also served as the Chair of the City of Alameda's Economic Development Commission, where he focused on business attraction and business retention efforts, and as board president for the Social Service Human Relations Board, he fought to protect safety net services for the most vulnerable members of the community. Rob served as a Deputy City Attorney for the City and County of San Francisco, where he represented the City and County and its employees and brought cases to protect California's residents from different forms of abuse. His legal career has included service as a litigation associate for a major Bay Area law firm and as a law clerk for Judge Alvin W. Thompson of the United States District Court in Connecticut. Rob is the son of a proud native Filipino mother and a father who taught him the value of public service to his community. They both worked with the United Farm Workers and were active in the Civil Rights Movement and the ongoing fight for social, economic, and racial justice. Rob graduated with honors from Yale College with a degree in History. After studying at Oxford University in England, he returned to earn his Juris Doctorate from Yale Law School.